Discussion in 'Leaping Arches, Driveway Arches & RGB Arches' started by ShellNZ, Apr 17, 2014. Here is the mailbox that I made last year for donations. 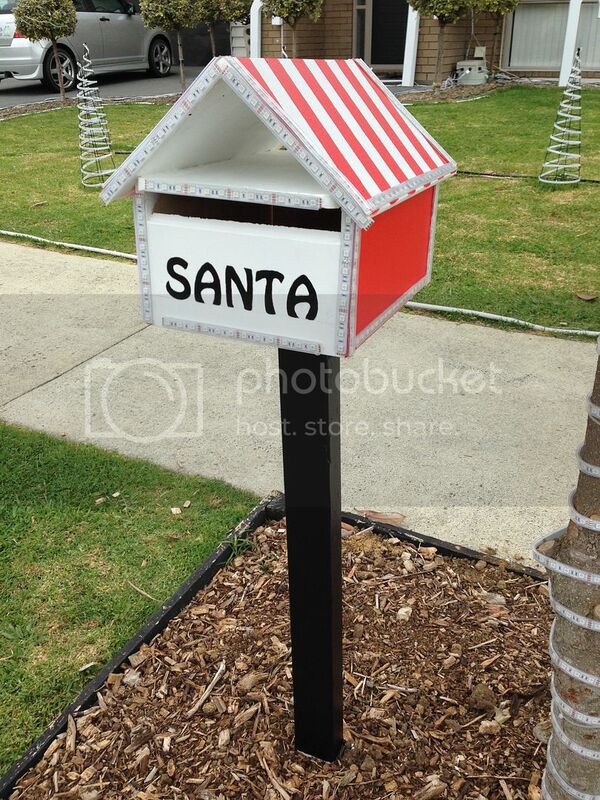 This year I am wanting to make it so when someone puts something in the mailbox will light up and/or play something like Santa saying "Merrrrry Xmas". I know there is the input pup from LOR, not entirely sure how it works and I what I would need to do to it to achieve the above. Could you rig up a pivoting door like they have at the top of charity bins and also the post boxes that take large envelopes. The one where you pull the slot open put in your item and then shut it and the item falls in. Could put a sensor/switch on the pivot to set it off. Got no idea how to do the electronics so the switch sets off the lights/sound though. Just realised you may not have the same systems for the post office accepting your mail in NZ. Let us know if this makes no sense and I'll try and find photos. Those dumb or smart pixels? Triggering lights is easy, arduino bit of code and IR beam or pressure sensor or some other way to trigger. To play sound you can do that but would add $30 odd dollars more as it would require a shield. Thats if you want this as a standalone device. Yes I want it as a standalone feature. Shell, this is probably bad forum etiquette, but, your photo reminds me of something that has been running around in the back of my head for a while. So.... asking a completely different question that has absolutely nothing to do with your thread, other than that it was triggered by your photo. How do people cope with having leads and props all over their lawn, at a time when the grass is growing very nicely ? I had two extreme thoughts - first was just to spray weed killer in appropriate places, so the grass would die. Second was to put down black plastic sheeting (and again the grass would die). The third horrible thought was to move everything around once a week. At that time, I ran out of further ideas. Ohh .. sorry ... can't help you with any solutions for your problem.... but I will be interested in the solution that evolves. Then a ir based relay with a little timer chip that you can set to apply power to light tester and mp3 player (maybe use a little bitty battery powered speaker like we get for the smart phones). I'm sure the hardware hackers can whip up the little circuit for next to nothing on a bread board and you should be good to go. Davrus, I mow the lawn weekly during showtime. Hubby is a lawn contractor with 3 staff and I dont trust them to do it lol, so I do it. That way if I run over a cable its my own fault. Like Shell, I don't trust anyone to mow other than myself. Does need to be done weekly although sometimes I leave it for two weeks. I have some cables under pieces of black rubber strip and mow up to that. Other areas, I just move things a bit - just needs to be done to keep it looking good especially if people come into the property and wander amongst the lights. And like Shell said, give the grass a no.1 hair cut. Anybody got a link to one of these testers? A 12V PIR motion sensor could trigger it Shell. There are a bunch of PIR flood lights that I know that Jaycar sell. With a bit of creative thinking the 12V led lamp that they use could be swapped out for an mp3 player and a simple LED chaser. The PIR sensor would have to be positioned so that it "saw" the hand as it was about to place money in the slot. http://www.aliexpress.com/store/product/DC12V-input-WS2811-LED-smart-pixel-controller-for-testing-max-100pixels-controlled/701799_652082488.html is 1 of the testers. There are 5V and 12V versions. They are only for 2811 pixels though not the dumb strip that Shell is using. A neighbour of mine who, admittedly was a robotics person, made a letter box the shape of an owl with two newspaper holes for the eyes and the letter slot for the mouth. It had sensors inside that triggered a speaker to hoot like an owl when a letter or papers were placed in the slots. It also was connected back to the house and inside he had a ceramic type owl on the wall with two lights for the eyes and one for the mouth and the lights lit up when something was placed in the slots so he knew when letters or newspapers were delivered.